Standing even at a good distance from a construction site is enough to give you an idea of how chaotic it gets there. Hoards of workers scattered around the area labour day-in and day-out to finish a construction project. The bigger the construction site, the more chaotic it is. It’s difficult to keep a tab on the hundreds of employees working on a project. Safety of these employees is also a major concern. 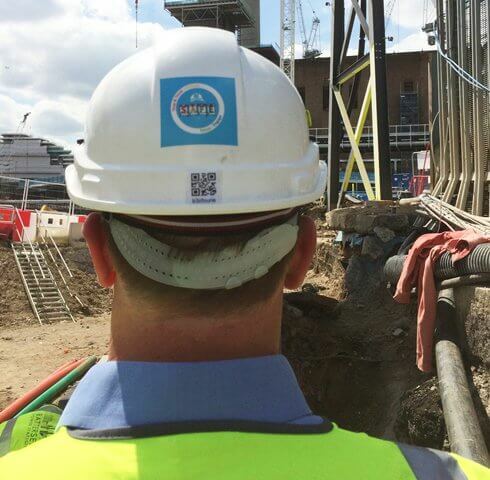 A UK based construction company, Blu-3, came up with an idea to handle this—QR Codes on helmets. The company has added a unique QR Code sticker on each worker’s helmet. The QR Code links to information such as, the worker’s name, emergency contact details, medical history, identification proof, and training history. The initiative ensures both the safety of the worker and quick competency checks. “This really is a breakthrough solution for ensuring staff are appropriately trained and certified for the roles they carry out on a site.” – Sarah Persad, Lead of the QR Code on Helmets Initiative at Blu-3. To view the data encoded in the QR Code, people must scan it using the Blu-3 app. Blu-3 plans to extend this system across all its construction sites based in UK and Europe. What are your views on the Blu-3 QR Code helmets? Share your thoughts in the comments section below.